A little less than a week ago, I started putting together a game as a fun way to review steps and skips. I began by drawing the game board. 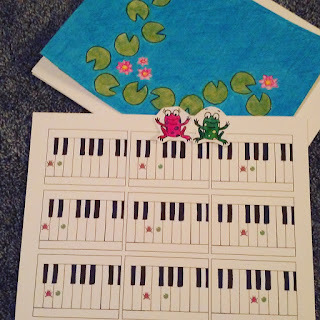 After I drew all the other components (frogs, keyboards, treble clef staff, bass clef staff), my husband helped me put it all together. I was very impressed by how organized he was and how quickly he worked! Of course, once everything was finished, I had to try it with some of my own students! They really enjoyed it! 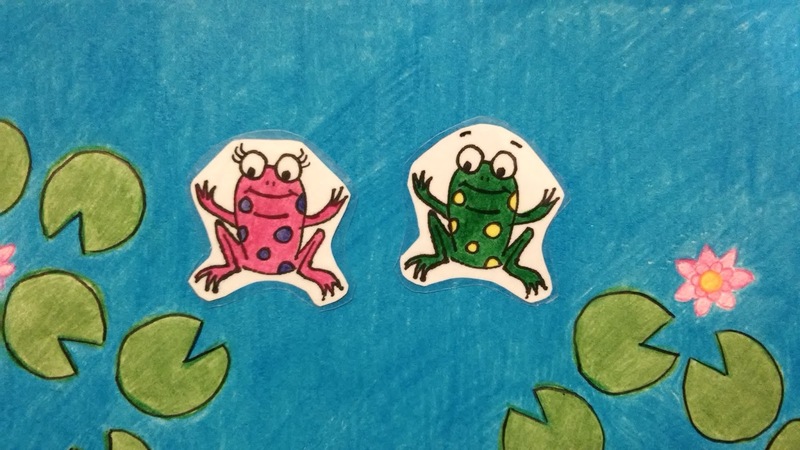 Print the game board, cards, and the green and pink frogs onto cardstock. Cut pieces out and laminate them for long-term use. 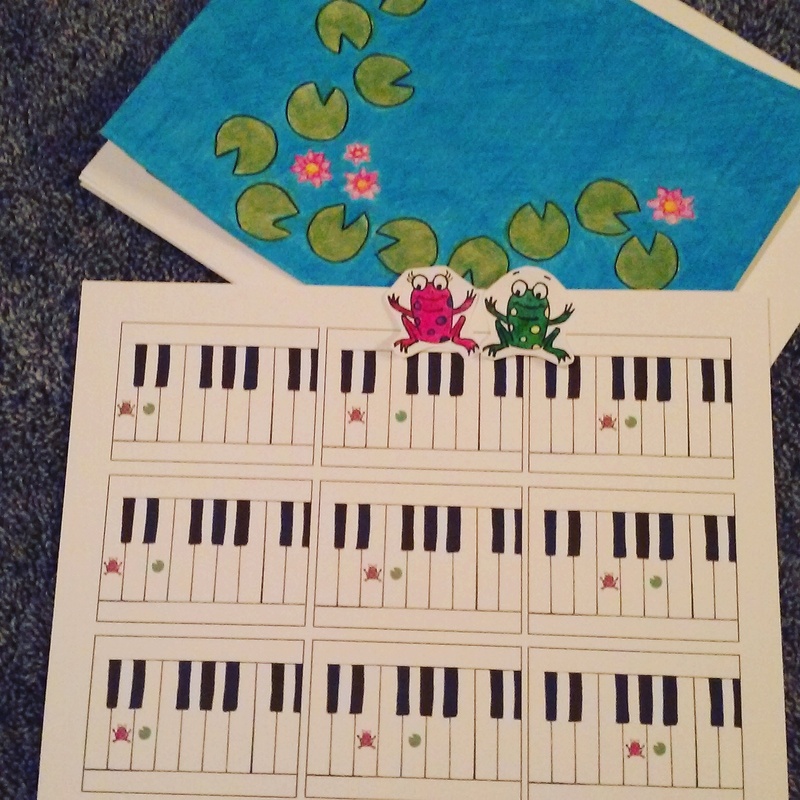 This PDF includes enough pieces for 2 players, but there is an extra frog that may be copied/colored in order to include additional players. 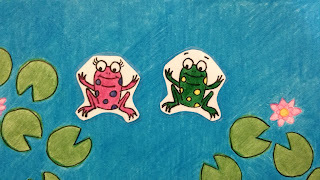 To play, each player chooses a frog and places it on the start lily pad. Shuffle and pile the Clara (ascending) and Franz (descending) frog Keyboard and Staff cards face down near the game board. Each player takes turns drawing cards. On the cards, the frog is always the starting point, and the lily pad is its destination. 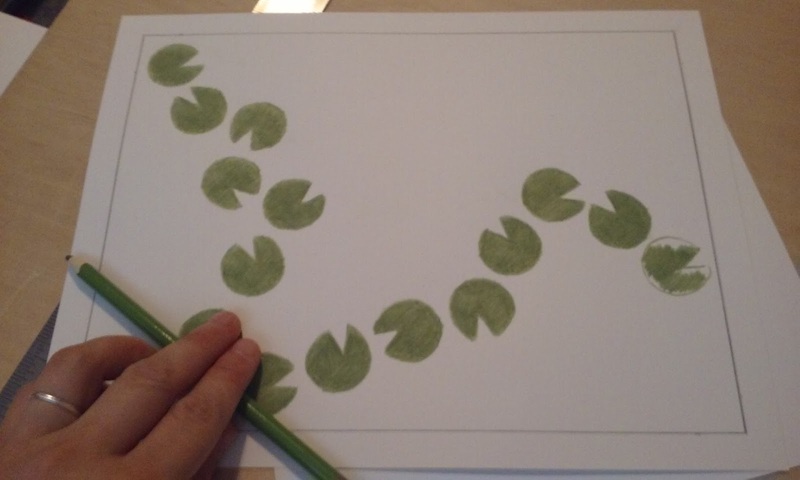 If an ascending step is drawn, the player may move their frog onto the very next lily pad. If an ascending skip is drawn, that player may move their frog ahead by skipping a lily pad on the game board. If a descending step or skip is drawn, the player must move their frog back by a step or a skip. 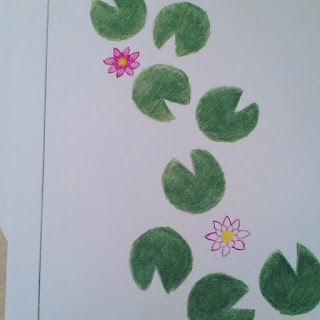 Continue playing until a player reaches the finish lily pad; the first player to reach the finish lily pad wins the game. For young beginners, play as directed above but omit the Franz (descending) cards. Pile the Clara (ascending) Frog Keyboard cards face down near the game board. Each player takes turns drawing cards. 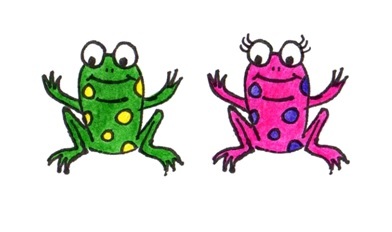 If an ascending skip is drawn, that player may move their frog ahead by skipping a lily pad on the game board. If an ascending step is drawn, that player may move their frog ahead to the very next lily pad. Whoever reaches the finish line first wins the game. 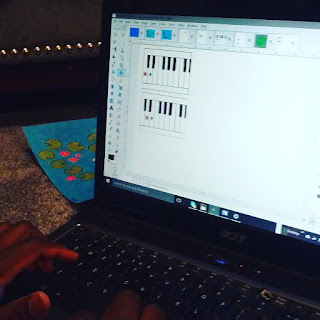 Play the game as directed above, but instead of having students draw the cards, develop ear-training and play the intervals, ascending and descending, and have the students move the frog game pieces accordingly. Use the Staff Cards as flashcards to help students quickly read notes and intervals.